While we enjoy science, we have not yet found a homeschool science program that is just “the” one for our family. Science Shepherd has definitely come pretty close with the product Miss J has been using recently – Introductory Science. I had heard about Science Shepherd quite a bit from my friends on the Crew when discussions about science came up. However, I had not checked into it because what we were doing worked. It worked but wasn’t great. 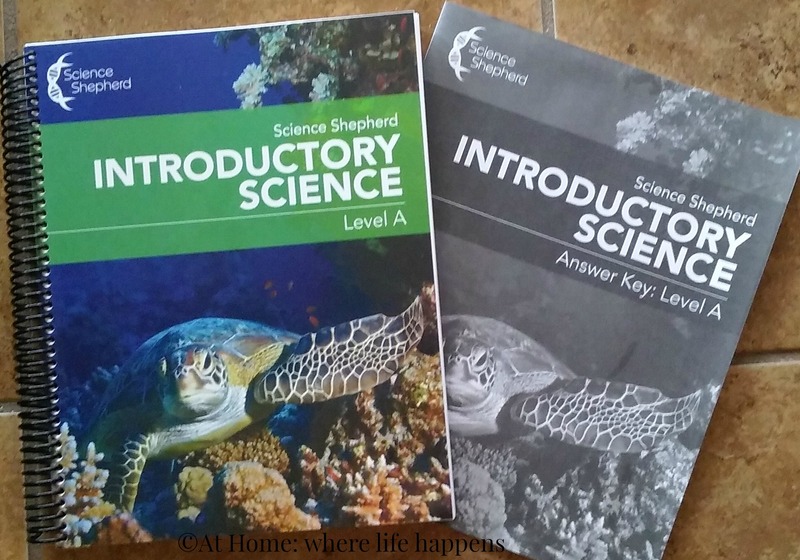 When we had the opportunity to review Science Shepherd and I took some time to look into it, I kind of wondered why I hadn’t paid more attention in the past. It looked great. And, we have not been disappointed! 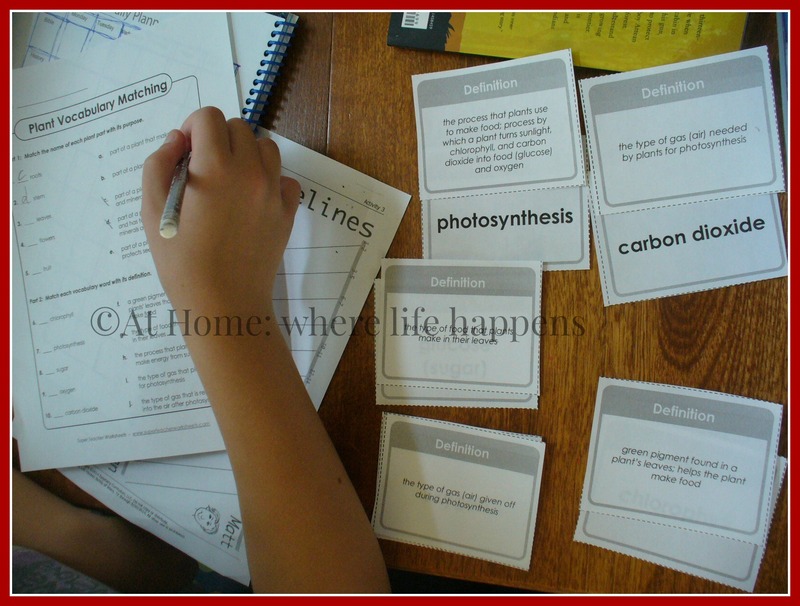 We have been using Introductory Science, an online video series and the physical workbook Level A. Miss J has been the student using it, though the other girls have been sneaking views of the videos while they are going on. The use of the program is surprisingly simple. You log into the site (you have to have purchased the course and have a computer with internet access as these are not downloadable) to access the video lessons. You click through to the video you are on and the watch and listen to the video. The videos are tending to run between 2 and 4 minutes. I am sure there are some that are longer but this is the range of most of them for us so far. After watching the video, the student completes the workbook page(s). Simple as that. In all, there are 35 weeks worth of lessons at 5 lessons per week. With a bundle of video demonstrations as well, there is a good bit of information in this program. It is not designed to be an in-depth study but is great for student who have not done a lot with science yet. That means it is perfect for younger students. Miss J is 7 and completing first grade; this is right up her alley! The level A workbook is good but I think she could easily have used the level B workbook. The level A workbook is designed to follow the video lessons. After watching each lesson, there is a page or two in the workbook to complete. The pages have a question or two, sometimes three. The print is large and well spaced, making it easy for new readers to be able to read. The lines, though they are single lines, are big enough to be able to use. Handwriting lines with a dotted center line would be super helpful here for these young writers and there is plenty of space on the pages to be able to do so. There is often a puzzle or activity of some sort, as well. A crossword puzzle or a word find or drawing a picture. 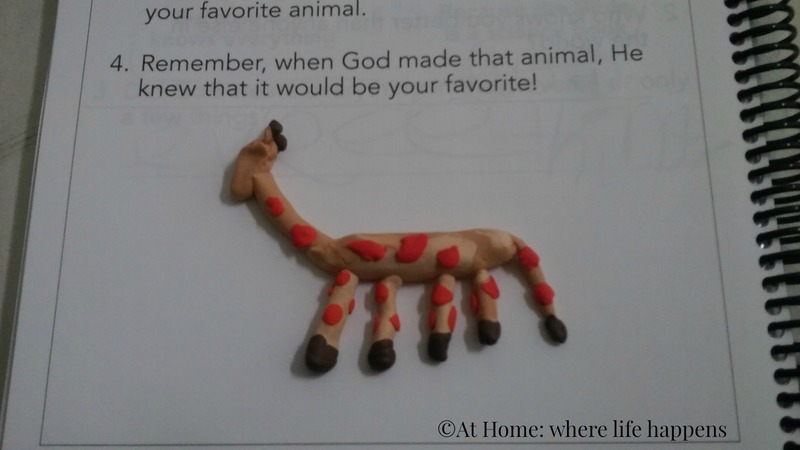 Once it asked for the student to create something out of clay. Something that I have really liked about this program and the workbook is its adaptability. 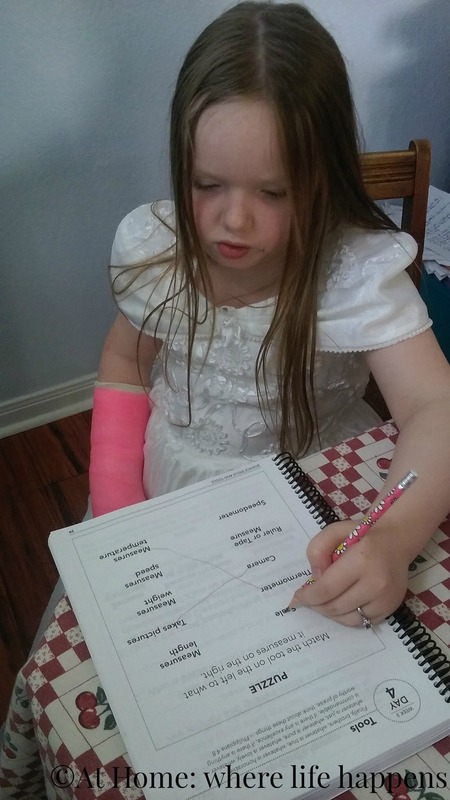 Miss J broke her arm, of course – the one she writes with, while we were reviewing this program. In regards to completing the work for this program, it was not a big deal. 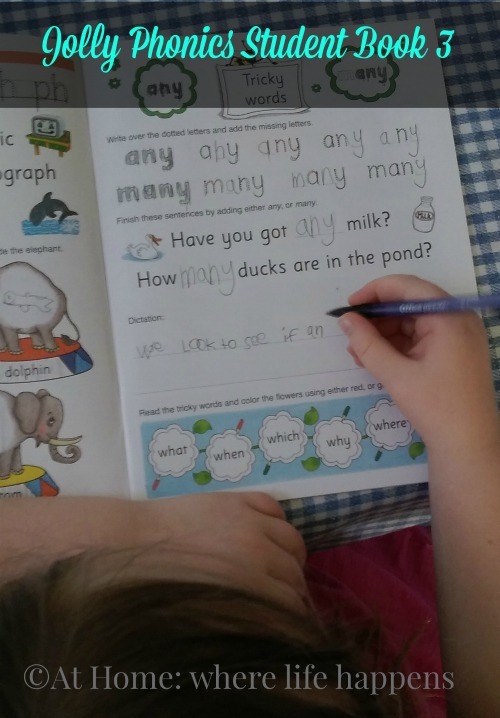 The workbook is done in such a way that instead of having to write answers, she could often just circle the correct answer in the question. Also, because the spaces were so large, when she did need to write or draw and wanted to do so, there was plenty of space. 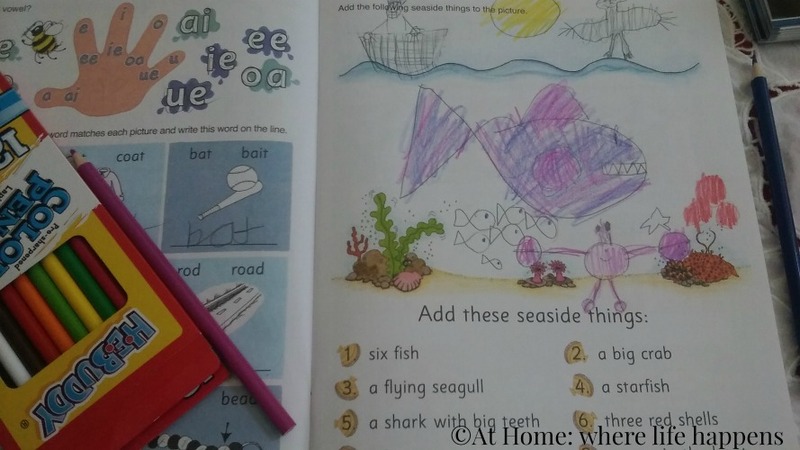 It also worked well for doing a narration-style answer for the workbook with a big sister or parent doing the writing on some of the questions and activities. Easy adaptation is a bonus for me. I loved it! I have a whole book full of pages for me to answer and get to watch videos to find the answers. This is truly a very enjoyable, gentle program. It is covering a lot of territory in topics and I am finding that some of that is really quite in depth, though not enough for it to be an upper elementary program in my mind. This is a very good, age appropriate program that exposes the children to a lot of the world of science through the lens of the Bible. Connect with Science Shepherd on Facebook, Twitter , and Pinterest. 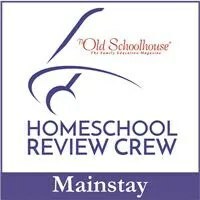 Read more Review Crew families’ takes on the program by clicking the banner below. Never in my wildest dreams did I think little Miss J would go ga-ga over Talking Fingers Inc. This has been an amazing review for us to be a part of and Read, Write & Type has been a wonderful learning opportunity. Talking Fingers Inc. is a company that desires to help children excel in reading, writing, and thinking. The idea that they can use these skills to change the world around them, earn a living, and contribute to bettering the world is central to the mission of the company. 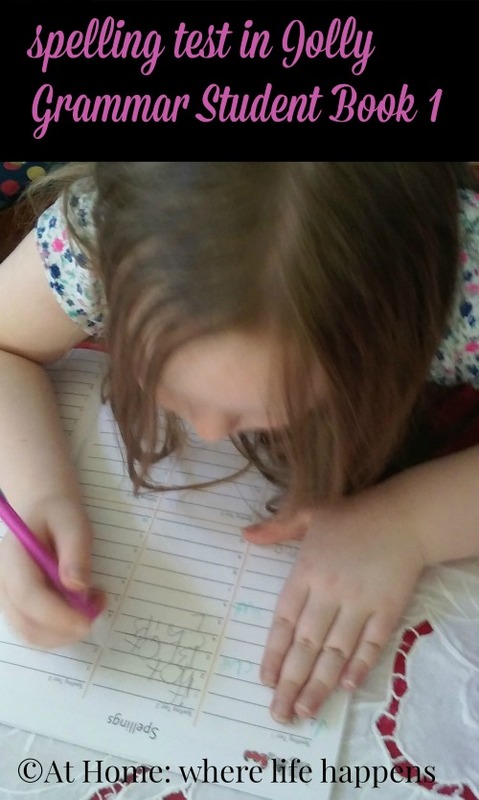 Based on the simple concept that writing is talking, the company created a program to teach children to connect sounds to letters and using those letters to “talk” with a pencil and paper or keyboard. With this program, you get more than just typing instruction. 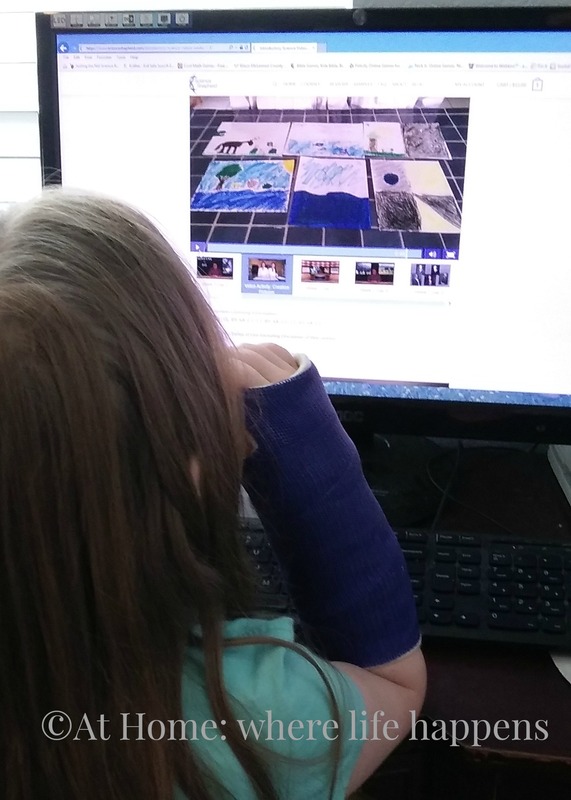 Yes, the student will learn to type and be continuously encouraged to do so with correct posture and position. But, the student is also learning so much more. 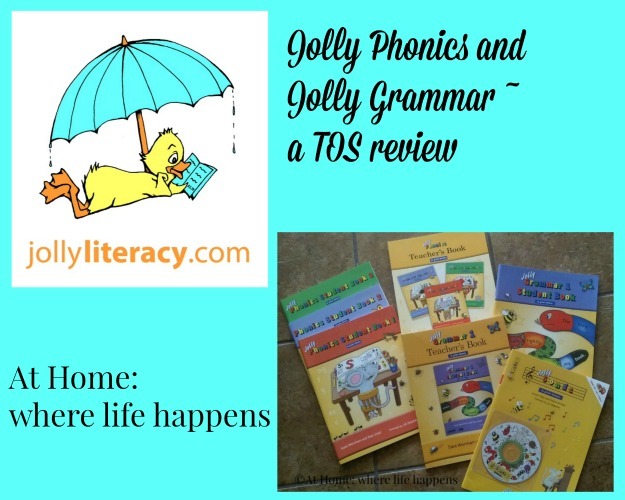 Phonics, letters, consonant blends, sentences, grammar, spelling, and more are seamlessly woven into Read, Write & Type so that without even knowing it, the student is learning multiple concepts, stretching the brain more and more. The program has also proven to be very effective for second language learners. So versatile! What a fantastic program! I’ll tell you a secret – I almost didn’t even ask Miss J if she wanted to try this. I didn’t think she would like it and I didn’t think it would be a good fit. I almost just said “no thanks.” I am so glad that I didn’t listen to myself! We signed up for the free trial and Miss J loved it. I figured that learning to type now would be a good thing so we’d take a chance with it. I had no idea just how much benefit would come from this program and just a few minutes a day. This program is so much more than typing. We started out with the program as soon as we received the email with the login information. Since this is an online subscription, you will want to have a computer for typing (not a tablet) and an internet connection. It is not a download, though they do have CDs available for older computer systems. Once we logged in, Miss J did not want to stop. At all! She became completely involved in the learning situation that was set before her. In a nutshell, there are storytellers who are waiting to tell their stories. They live in two houses, which are the two halves of the keyboard. Just as they are ready to tell their stories, a mean ‘ol computer virus named Vexor steals the letters and you have to retrieve them, saving the storytellers from Vexor one at a time. To give you some assistance, there are two Helping Hands: Lefty and Rightway. These two help guide the student through the games and activities, building sounds and sentences and stories as they work to save each of the 40 letter and sound combos. At the end of each successful level (a set of 4 letters or letter combos saved), the student receives a certificate. This is brightly colored, personalized, and so much fun for the student to receive. We printed these in black-and-white (I cannot seem to remember to go get colored ink!) and Miss J is so proud of each one of them. 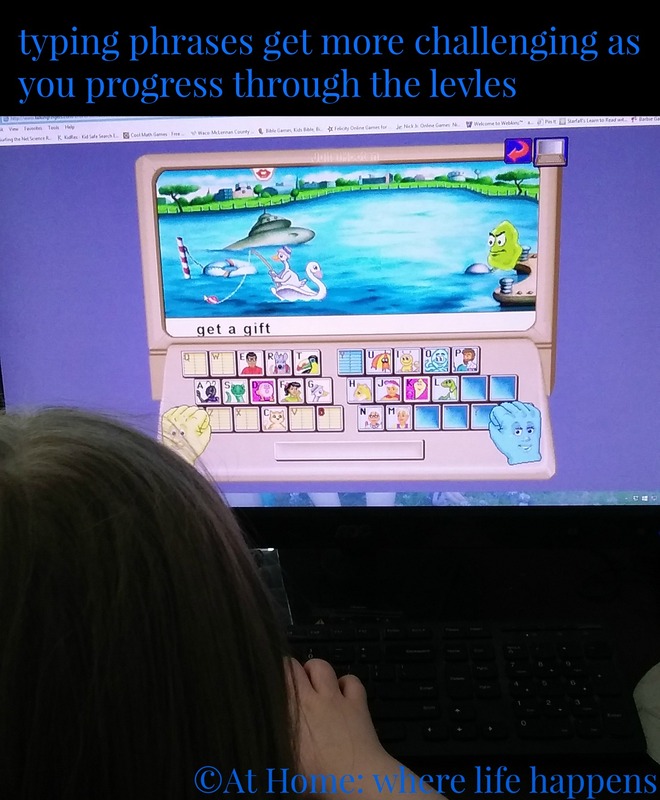 She has completed 7 levels at this point with only 3 more to go. Why is this program so successful? I am certain there is a lot of brain research that would tell you the scientific parts of it. 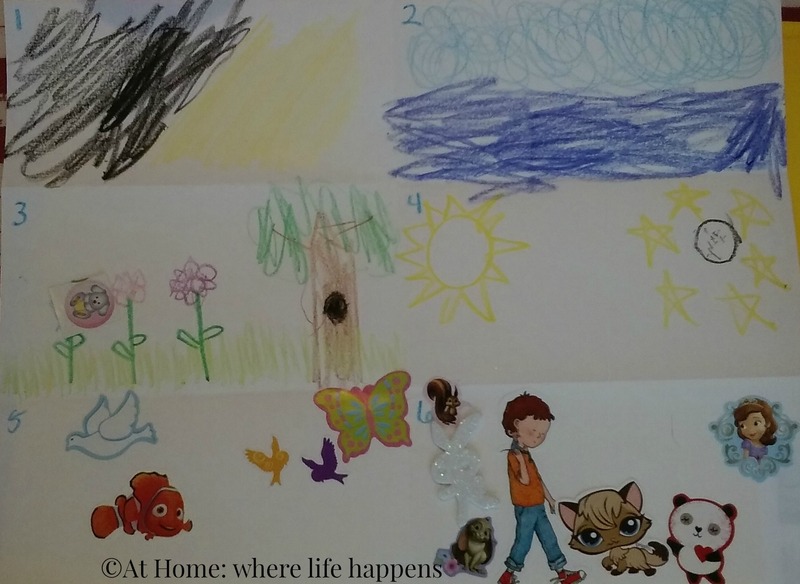 From my perspective, the program is successful because it engages the brain with visual, verbal, tactile, and oral uses. The student sees the sounds, words, or sentences. The student hears them being read to them. The student repeats it and then types it. All these go together to engage the student fully in the learning. Add to it fun colors, exciting stories, and funny characters and you get something that just fits. She is having such fun with this program. She has made tremendous jumps in her reading and writing and spelling abilities since we started this program. I am sure that some of it is to be attributed to Read, Write & Type. Not all, since she was due for a big learning jump, but I know for a fact that Talking Fingers Inc. has helped her a lot. If allowed, she would sit at this program all day long. It is a hit! Read additional reviews on how others have used this program at the Review Crew by clicking below. 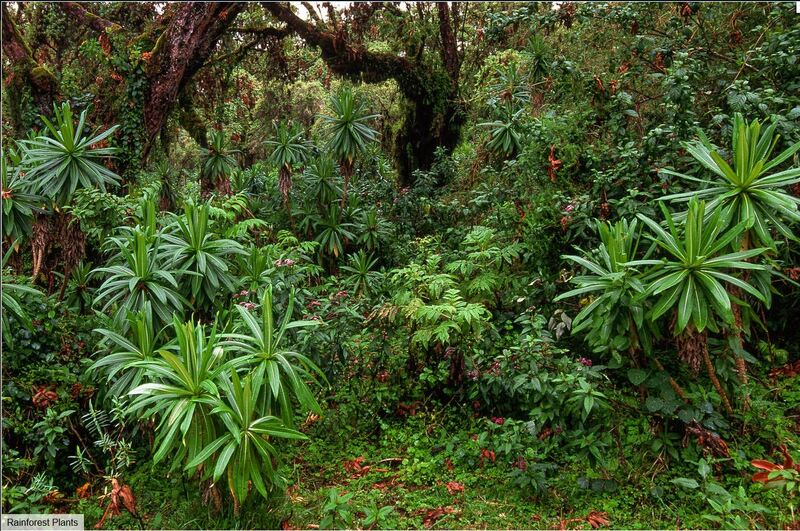 I have always enjoyed reading about and seeing pictures of rainforests. 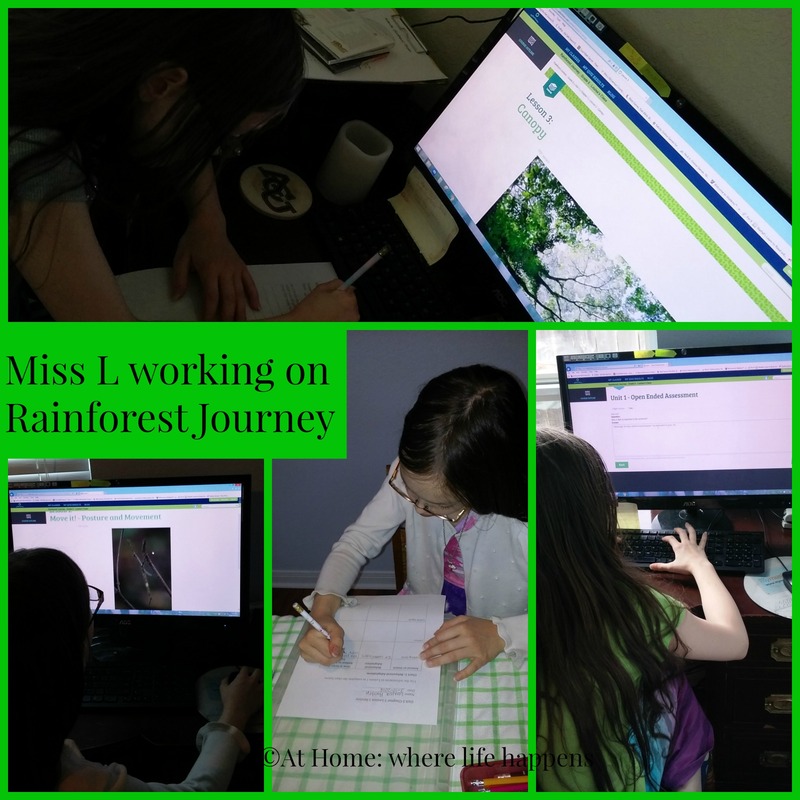 Seeing how the girls have responded to EdTechLens and their Rainforest Journey while we have been reviewing the program has been a joy. Miss J has been working in Grade 1 and Miss L has been working on Grade 5. EdTechLens is an educational program developer. They are developing online curriculum to meet the needs to home educators, as well as public and private educators. Their age focus, for now, is at the elementary level. Rainforest Journey is the first of three science offerings they plan to have available. Other content areas are in development. 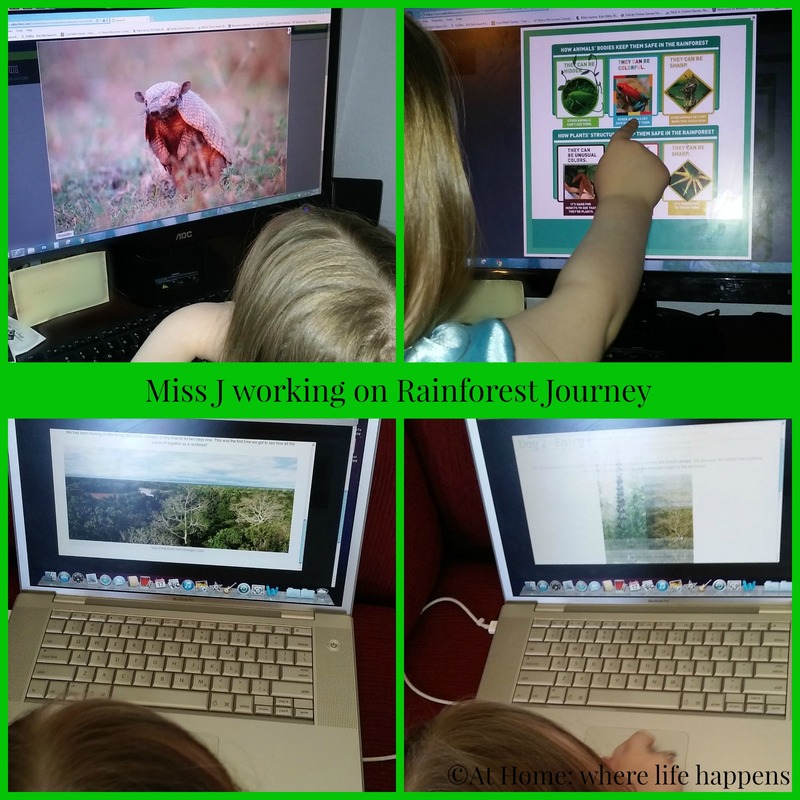 Rainforest Journey is just that – a virtual journey through the rainforest. Consisting of five units, this program uses beautiful photography, gorgeous videography, and first hand accounts from scientists and rainforest visitors to take you on your journey. Each unit has several chapters, vocabulary lists, illustrations, and assessments all related to the unit topic. In the teacher’s account, there are also hands-on activities related to the unit. 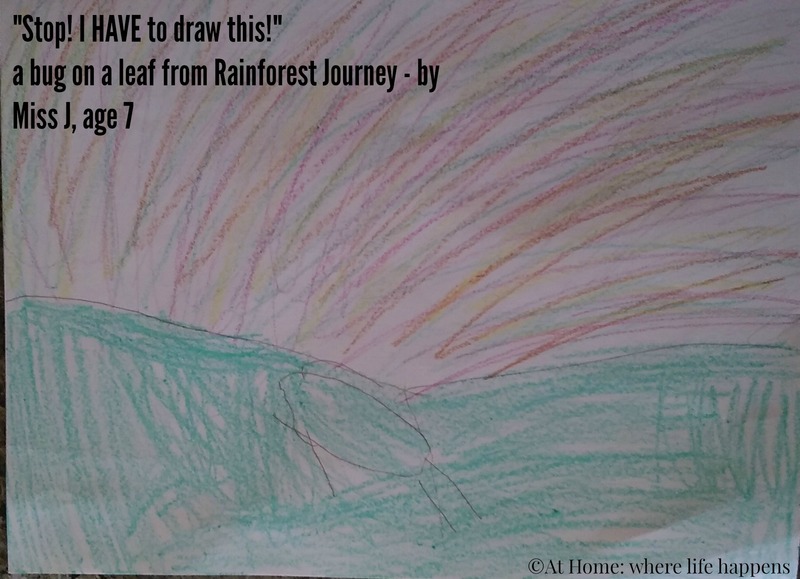 Rainforest Journey includes some primary source material. There are some very short interviews with scientists: Expert Interviews. There is a trip journal. The last type is video footage of different sights and sounds in the rainforest. There is a teacher side and a student side to the program. The teacher account has access to everything already mentioned but also has the ability to score assessments and track progress. Additionally, there are science standards, Lexile scores, and word counts for each passage. Rainforest Journey is super appealing to the girls. There are vibrantly colored photographs and the videos are stunning. It draws the children right in. In fact, one of the girls claimed “It looks so alive!” And it’s true – the photos and videos draw you right into the place and make you feel as if you are there. They are unbelievable! This alone makes this program a joy to be using. In the very first lesson, Miss J hollered “I HAVE to draw this!” So she took the time to draw what she was seeing. Additionally, it can be used fairly independently, which the girls like. There is a voice recording that can be chosen for each passage, if the student wants it read to them. The only place this is not true is in the primary source materials. If you have a student that can read pretty well, this is not an issue at all. When it is Miss J’s turn, she and I sit down together. She logs in to her account and begins. She has the program do all of the reading when it is available. I read her the captions on the pictures if she cannot sound them out (which is often since they are commonly the names of the plants, trees, or animals). She follows all of the links. Then, depending on the lesson review, we may or may not print it. Most of the time, we did not print it because it was not an age-appropriate activity. Most of the first grade reviews were to be written on a page lined with single lines, rather than the three-line set-up a new writer needs. Also, the questions were pretty high level for a first grader (and I have a pretty smart one on my hands). I reworded and reworked many of her reviews. We often did the reviews verbally or I would do the writing. This is also how we did the assessments. There are three unit assessments, at least one of which is open-ended. We did have the option to print but it just didn’t make any sense to when her answer verbally would be much more thorough. So I typed her answers. When Miss L is working, she logs into her own account. She navigates to the next lesson and begins. She reads, views the pictures, follows links to primary source materials, and then prints her lesson review. She logs out and completes her review. Miss L’s reviews were fine because she likes to write. But it would often ask the same questions with minute variations for each chapter of a unit. 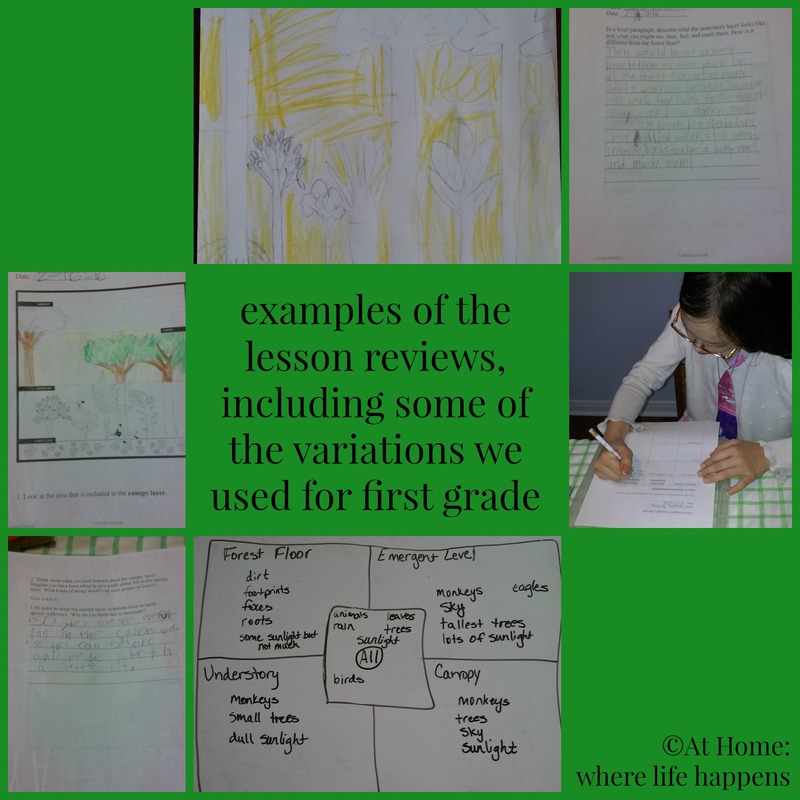 For example, in the adaptations unit, the lesson reviews looked exactly the same for each chapter of the structural adaptations with only the type of adaptation changed. The final review then asked them to evaluate which ones was most interesting from previous reviews that were all so similar. At the end of each unit, she completed the assessments on the computer. She typed her answers into the computer and then I went in later and graded how she did. It gives a sample answer to help the teacher in the grading. 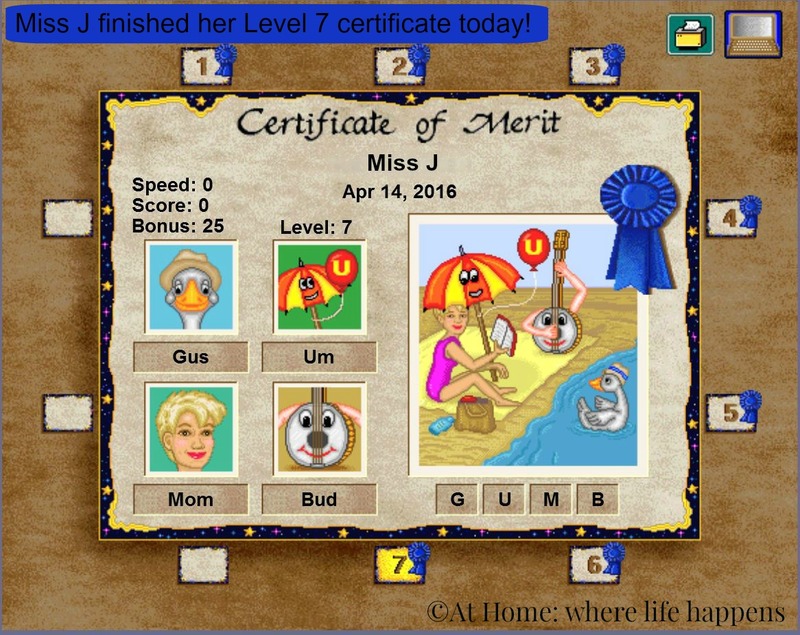 During Miss L’s turn at the computer, Miss J is watching and asking questions because the two levels have completely different pictures, videos, and often times, information. Going through both levels allows the girls to get a much more thorough understanding of the topic. As I noted before we used both first and fifth grades. Neither of these are good level indications, though. Both levels needed more complete information in the lessons. We often had to go searching on the internet to find information to answer the review questions. I have noticed that there are many places where information from a later chapter would have helped in an earlier one. In the first grade, the lesson review and assessments are completely off what is age appropriate: almost all writing essay-style answers. Fifth grade wasn’t too bad, though we had Miss L working a grade level up from her normal level because this appeared just too easy. I was hopeful that 5th grade level would challenge her some. It did not. I really like the photography, the videography, and the illustrations. I have enjoyed this journey and we will finish it out. 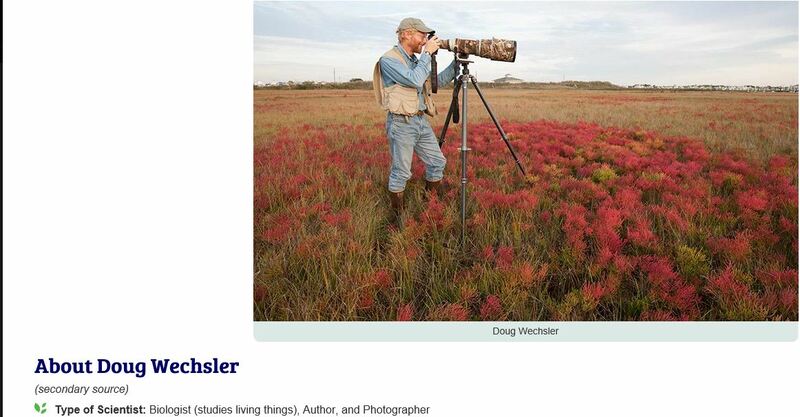 I would like to see EdTechLens develop this more fully so that it acts as a life science course. At this point, it is just something fun. 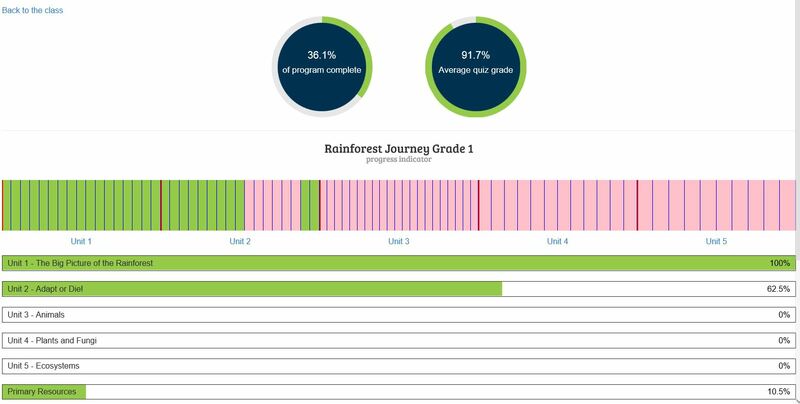 It is completely possible to complete Rainforest Journey in a couple of sittings if you don’t do the reviews and assessments. It would serve well as a supplement to a life science course. Read more reviews from others on the Review Crew. We had so much fun with The Giving Tree. It is such a rich, deep book and there are so many opportunities to extend learning. Without further ado, here is the unit that we enjoyed. What is the main idea? Give examples and support your response. Discuss the idea of giving all you can and all you have to one you love. What might this look like for a human? Is it good or bad? What are the implications of this? God’s perspective: He gave all! Why? What did that look like? What did that do for us? Our perspective: What do we give to God? What do we give to others? Write a shape poem using a tree form. For older students, write a persuasive essay about why you should or should not give all you have to one you love. Rewrite the story or a scene from the story from the tree’s perspective. Write sentences. You could use vocabulary you choose from the book or write sentences using vocabulary related to trees. 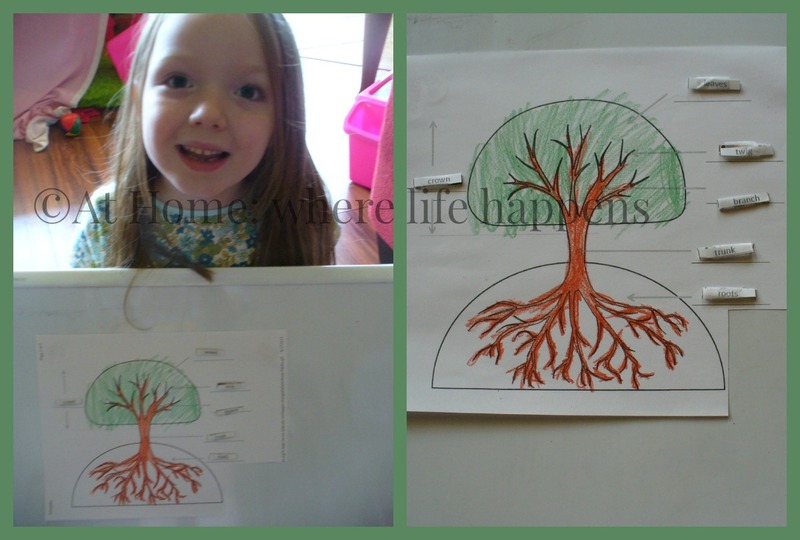 We did the later and J used a cutting page from Super Teacher Worksheets relating to plants and trees and their growth. A tree unit is a natural outgrowth of from this book. Learn the parts of a tree. We used a printable we found online. (The site it was from is no longer a valid address, evidently, so I can’t share that with you.) We glued it to magnet pieces and cut it out. (We used old refrigerator magnets from companies that we get in the mail. I save them for things like this. They are thin and easy to cut with scissors.) Then J matched up the parts of a tree on the white board. Learn about the uses of trees. We researched and discussed the many different ways trees can be used – building, furniture, fuel, recreation, hobbies, etc. Learn about the growth of trees. Visit a museum about trees or your local Forest Service station. We visited a museum that had a small exhibit about trees. If your museum had a large tree section with the rings visible and marked, it is really interesting. Talk about the season and how the season affect trees and their growth. Learn about different types of trees and leaves. 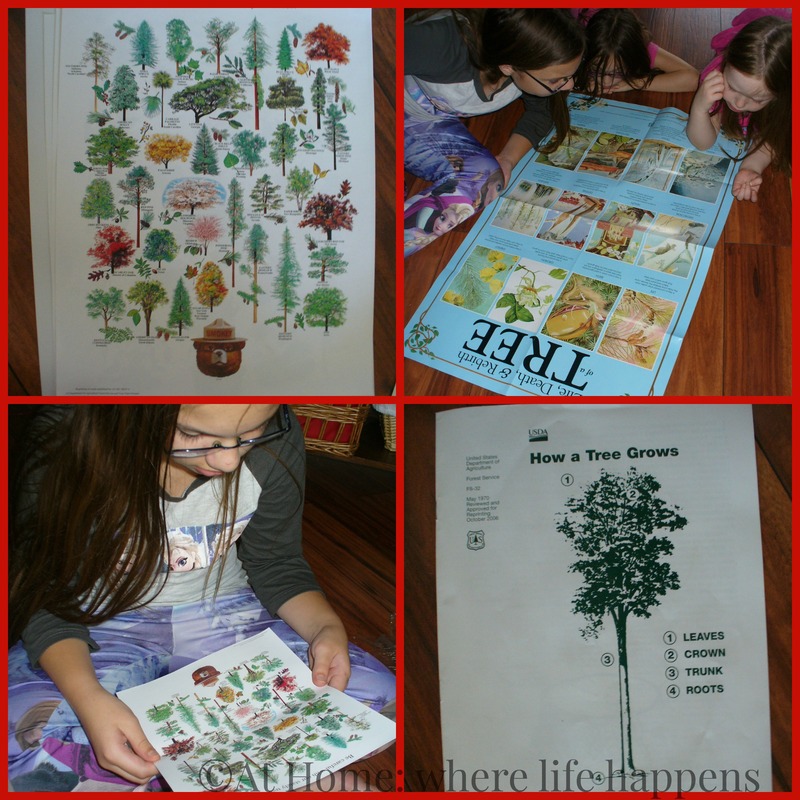 We used a set of posters from the Forest Service to study various trees and leaves, as well as animals that live among the forest trees. Learn about managing growing things and resources. Learn more about how the forests are managed. Discuss wildfires and forest fires. Discuss their impacts on not only the forest and the animals that live there, but the people, their property, and the larger environmental changes that happen because of forest fires. We viewed pictures of forest fires, including the Little Bear Fire that affected a place near and dear to us a couple of years ago. We have talked about changes because of that fire and what the effects of that were. If you visit a museum that has a huge tree ring, you could study the events marked through the rings. Study the history of the Forest Service. Research one of the National Parks or Monuments. Find out about why someone chose that particular section of natural resources and forests to preserve. 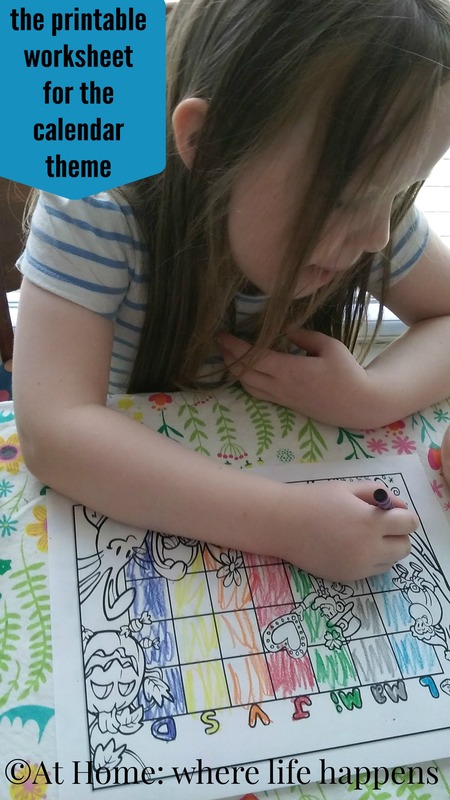 Use water color crayons to create a picture of a tree. 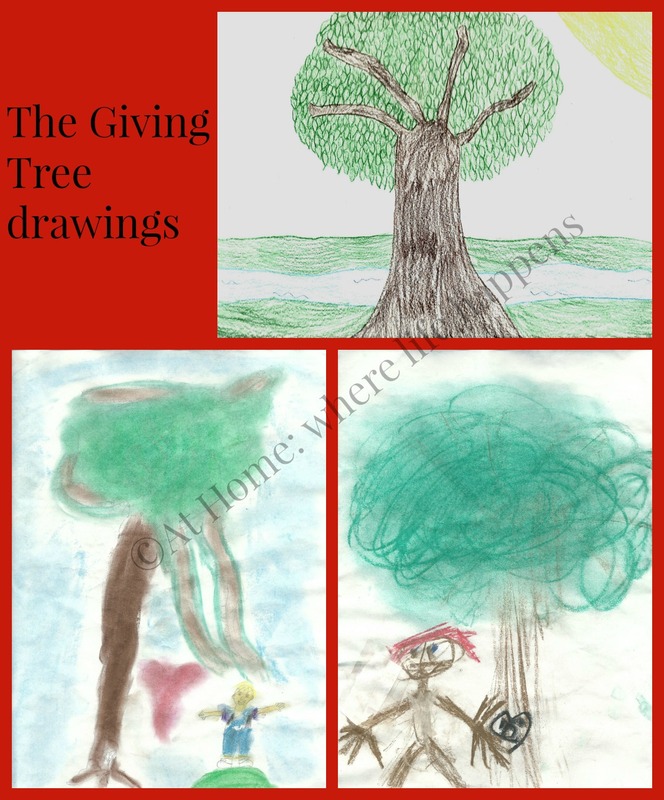 Use colored pencils to draw a tree showing the various parts. I found this post from The Inspired Classroom which was super helpful. 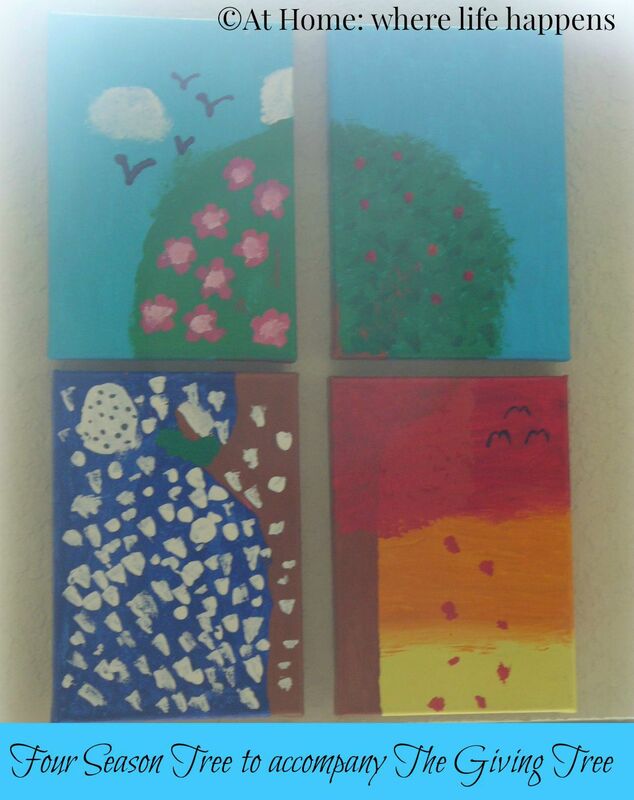 Make a canvas set that shows the various seasons of the year and how they impact a tree. See our project here. Memorize Psalm 1. We memorized this passage a while back but we went back and reviewed it several times during this study. Matthew 12:33 “Make a tree good and its fruit will be good, or make a tree bad and its fruit will be bad, for a tree is recognized by its fruit.” – Discuss this and how this is seen in real life. Apply this to the lives of the students. Have students create motions and movement to help them memorize this verse. Apply this verse to the Giving Tree and have students give concrete examples of why they chose which kind of tree the Giving Tree was. Create a paper tree with the different parts of the story. Attach magnets to the back and use it for retelling the story. You can make your own or print a copy of this one that I made for J. Watch a video of this book. There is one we found on YouTube of Shel Silverstein telling it. It was interesting for the girls to see the author and to hear his voice. It was nothing like we expected. Just do a search on YouTube and it should come up without any trouble. Watch a video of the book being told in sign language. Two of the girls are studying sign language so that was a fun thing for us to see. We also watched a video of a young boy and girl with their mother retelling the story. The girls learned a lot of signs from watching these two youngsters. There are many versions of the story on YouTube so find something fun that will appeal to your students. Take a field trip to visit a museum that has a big tree section with rings that go back hundreds of years. Or go to a tree farm. Or just go to a forest and walk around, observing all that you can about the trees. I tried to keep this one shorter so if I did too short of a job on the description for something you want to know more about, leave me a comment and I’ll try to give you more information. 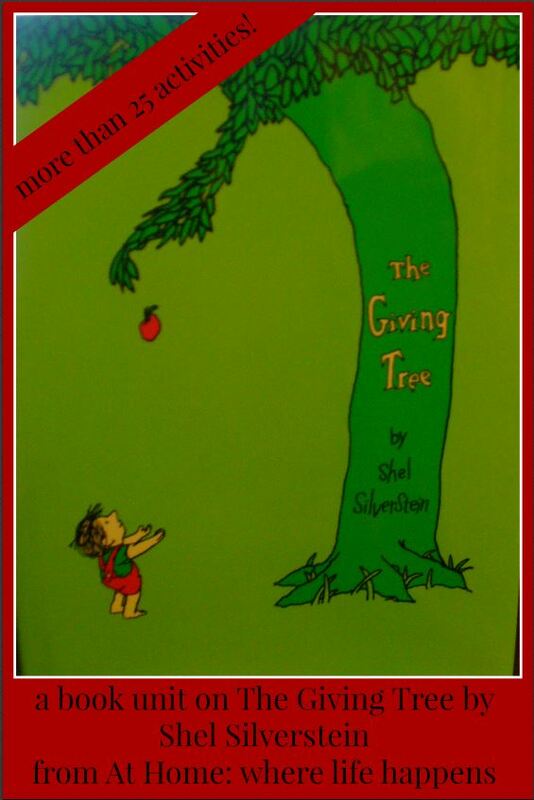 Most of all, though, the Giving Tree was a fantastic unit that just kept growing and growing from the interest the girls had in it. Enjoy! J absolutely loves the book Library Lion by Michelle Knudsen. We read this book together every week, I think. So, when it was time to start thinking about unit studies with literature for her this year, I jumped on this one. It was super fun to create and we have really enjoyed doing a lot of the activities I wrote about. There is a lot you can learn from this book. 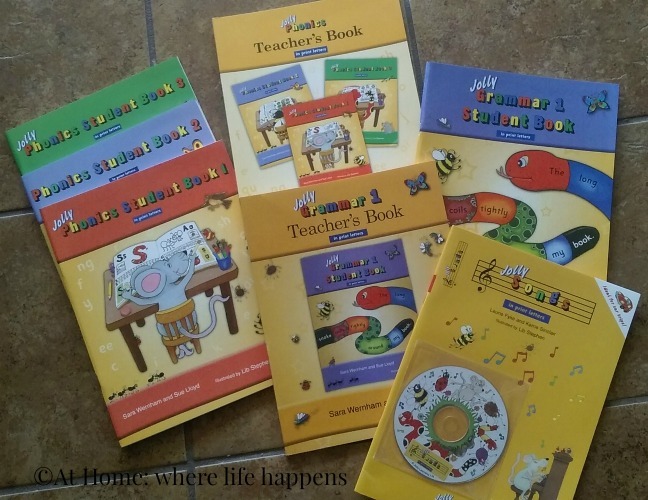 The unit I created was shared over on Proverbial Homemaker as part of the Children’s Literature Unit Study Series. Please head over there and take a look. If you choose to use the unit, please come back here and share with me about it. I appreciate all feedback as I strive to write good materials that benefit not just my children but anyone who chooses to use the units. Enjoy Library Lion! When languages fascinate, the opportunity to review an online language learning program is exciting. 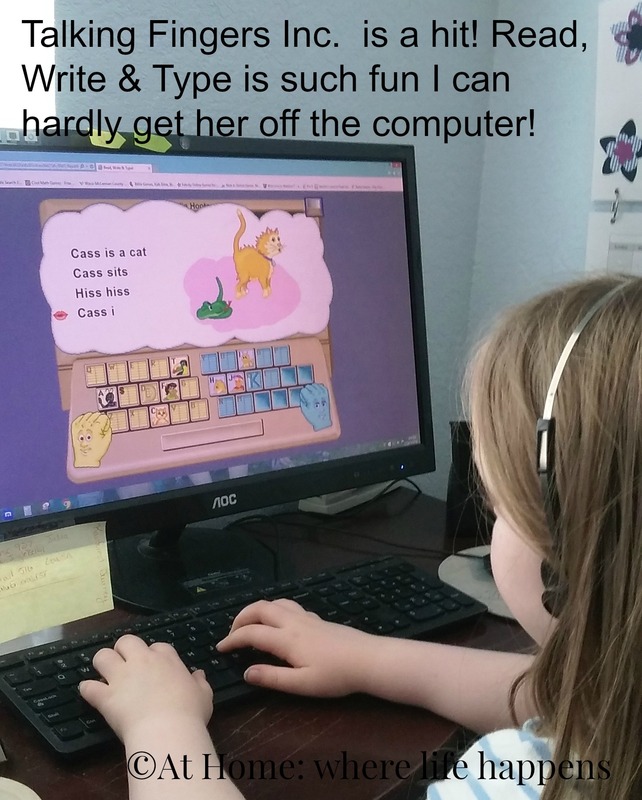 The youngest giggly girl loves languages and Middlebury Interactive Languages has been a great fit for her. 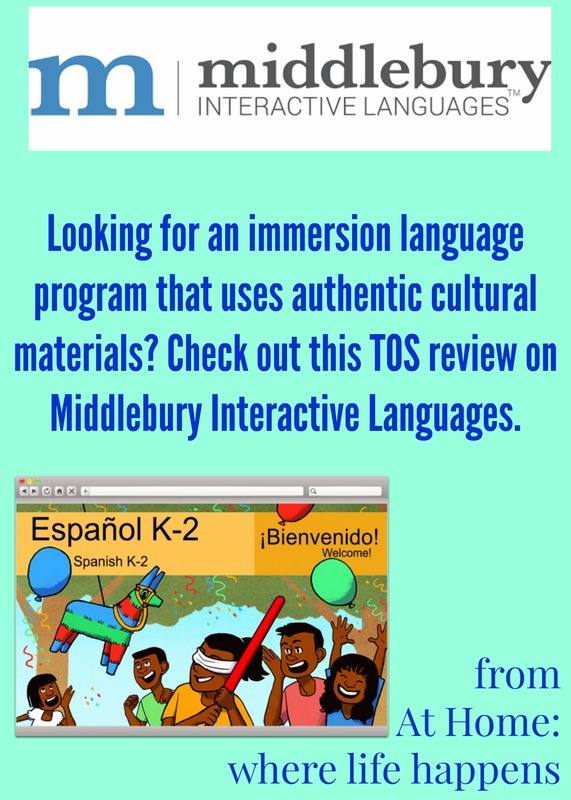 We reviewed Middlebury previously and J used the first semester of their Elementary Spanish I, K-2. This time around she was able to complete the second semester of this course. There are a number of Spanish Courses available, from Kindergarten through high school, including an AP course. J was just as excited this time around as she was before and insisted on completing more than one lesson each time. Most common, she completed an entire unit at a sitting. She will be going back through the lessons if time permits before the subscription runs out to help engrain the learning in her mind. But she is getting it and remembering it. That is what happens for her when learning is authentic. What I mean by that is the learning is done true to the situations in which it will be encountered or through stories and songs and discussions. 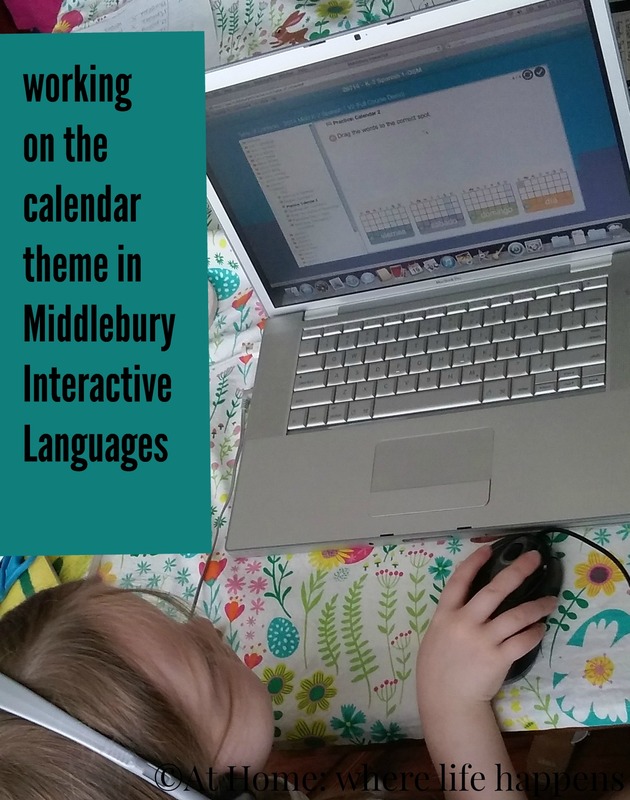 Middlebury teaches their elementary courses through themes – colors, numbers, body parts, and more. Then, using authentic stories, fables, myths and legends, the vocabulary is emphasized within the story to help the student understand and gain the context use of the words. This helps the student understand the culture while learning the vocabulary. When the learning is authentic like this, I see the application of it happening in daily life. It is not at all unusual for J to use Spanish words to ask for something or to discuss something. No, they are not yet complete sentences but she knows and understands the words she is using. A big part of that understanding comes from the authenticity of the teaching and the age-appropriateness of the topics and themes. 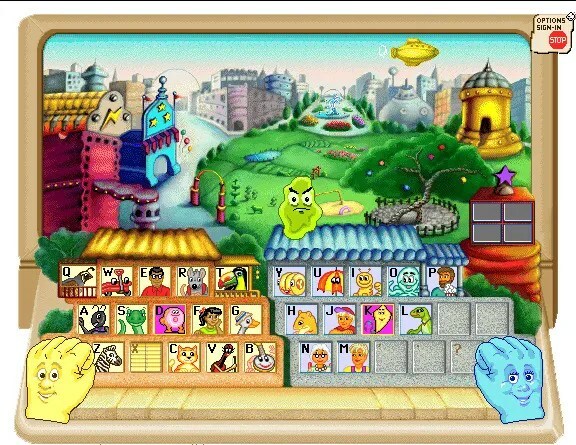 The immersion in the language, combined with the funny cartoon characters and variety of activities has made all the difference. In any given unit, the student will experience a wide variety of activities and immersion moments. Each unit begins with an exploration of the words that are the focus of the unit. Then there will be a story told entirely in Spanish with illustrations and words on the screen to help the student follow the story line. Then the student will revisit the cartoon and the movement will stop on certain scenes to help focus the student’s attention on the key words for the unit. After this, the student will begin listening to words and matching them to a picture or setting. 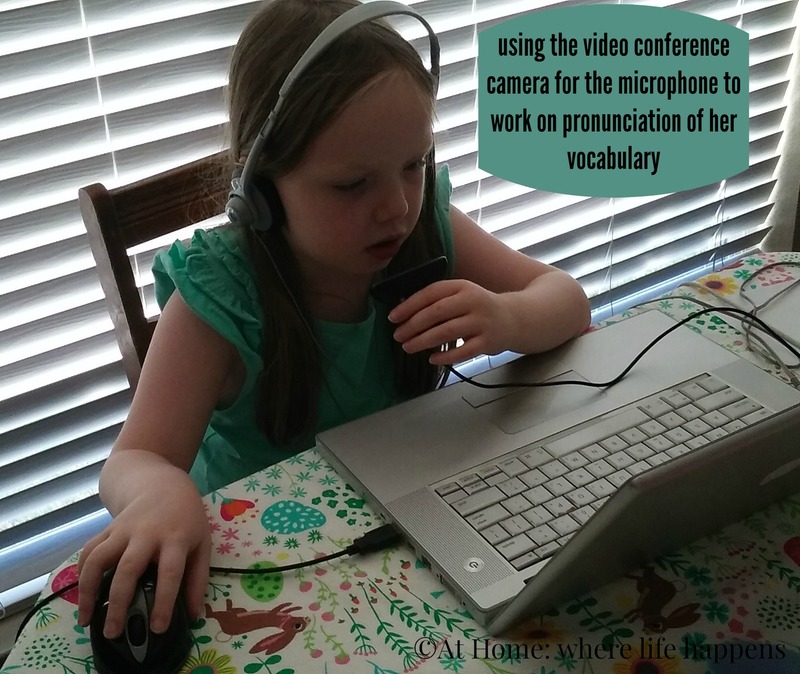 The student might match the written word to an audio of the word. The student might have to click on the matching picture of an audio prompt. There is a lot of verbal work with the program. The student is exposed to the pronunciation a lot during a unit, as many as 20 times or more. This is very helpful and by the end of a unit, J’s pronunciation is pretty good. Each unit generally has at least one printable worksheet for the student to complete. 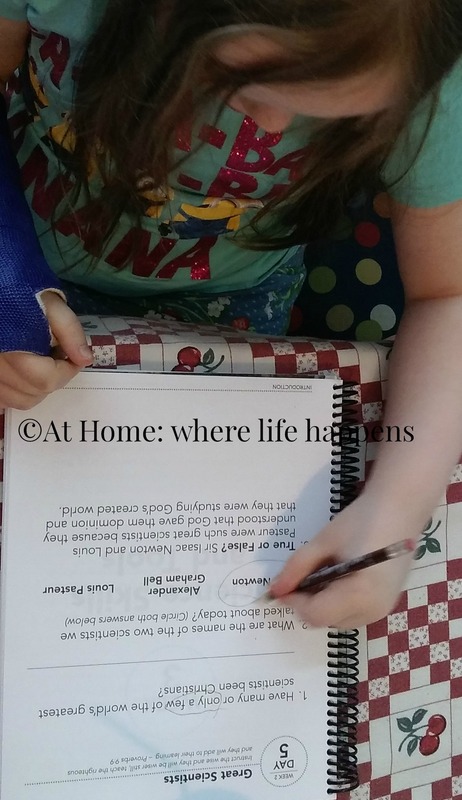 There are coloring sheets, vocabulary lists, full stories, and worksheets to go along with the lessons. Most units have seven lessons. At the end of the unit, there are tests for matching the words and phrases but there is also a speaking lab test. In the speaking lab, the student has to pronounce the words. This provides a well-rounded, experiential exposure for the student to the language and its use. Each part of Middlebury’s unit works together to give the student a very diverse, immersion into the language and culture for a better understanding. a subscription to the site (either with or without a teacher; see options for Spanish Courses). ***We used this program without issue on both a relatively new desktop PC and a pretty old Mac laptop. ***For the microphone, we hooked up our video conference camera. The microphone worked with the program just fine. We had some of the same issues this time around with navigation. When you log into the site, there is a fairly blank screen. Time and again, I have had to remind her where to click to find the table of contents. Then she had to remember which unit she was on. Once to this point, there are check marks that come up when you have completed a lesson (if the student remembers to click to have the activity checked) so it is easier to find which lesson of the unit you are on. I would love to see a navigation that required a lot less clicking from the initial page, especially for these younger ages. My 11 year old was more than capable of helping her get to her lessons but as a 6 year old, it was just too many clicks for her to remember. We have really enjoyed this course, yet again. We love the interactivity of each lesson and the inclusion of cultural lessons and stories/myths/legends. It makes for a language learning experience that is remembered. For further reviews of Middlebury Interactive Languages, including French, German, and Chinese, click on the banner below.